Jim Tavaré will return to co-star in the second series of The Sketch Show on June 22 2003 on ITV, which won a Best Comedy Series BAFTA and was nominated for numerous other awards including a BANFF Rockie Award, a Golden Rose of Montreux Award and a British Comedy Award and will return to ITV1 early in 2003. Jim starred in the first series of The Sketch Show co-produced by Avalon Television (Time Gentleman Please, Harry Hill, Fantasy Football, The Frank Skinner Show) and Baby Cow Productions (Marion and Geoff, Human Remains) in Autumn 2001 on ITV1. The series also featured Karen Taylor (Daily Telegraph Open Mic Award finalist), Lee Mack (Perrier Nominee 2000 and Time Out Award winner), Ronni Ancona (Broadcast Award winner) and Tim Vine (Perrier Nominee). He is currently filming Harry Potter and The Prisoner of Azkaban in which he plays Tom, the inn-keeper of The Leaky Cauldron. Jim Tavaré has been described as "transcending mainstream and alternative comedy". As a stand-up Jim Tavaré has worked all over the world, performing throughout Europe, Australia and the USA, Jim has made frequent visits to The Falkland Islands to entertain the troops and was invited back for a 2 week run in March 1999. Jim appeared at the Auckland Comedy Festival in New Zealand, which was a sell-out success. Following appearances in the US, a special episode of WINGS (NBC/Paramount) - the hit comedy series made by the producers of CHEERS - was written around him. Jim Tavaré's US television credits also include CAROLINE'S COMEDY HOUR, EVENING AT THE IMPROV, SHOWTIME MONTREAL GALA and JUST FOR LAUGHS. Jim has performed three times at THE ROYAL VARIETY PERFORMANCE, including one occasion in December 1998 before HRH The Prince of Wales. Jim now has the proud title of being Prince Charles' comedian of choice, having performed at His Highness' private Christmas Party 2001 and in front of Her Majesty The Queen and 13 Heads Of State at a Gala held at Highgrove, in aid of the King Of Greece's birthday. Jim Tavaré made his first appearance on British television starring alongside Miles & Milner in the critically acclaimed comedy show BEETHOVEN'S NOT DEAD (BBC2). This was followed by his own series on BBC2, JIM TAVARÉ PICTURES PRESENTS... a series of short films starring Jim and Bassie, his double bass. Invoking uncanny memories of Buster Keaton these films were seen as "a great compliment to Jim's superb stand-up routines" (The Scotsman). He starred as a headline act on series 1 & 2 of Channel 5's stand-up show THE COMEDY NETWORK and Jim has also performed on THE DES O'CONNOR SHOW (ITV) and CLIVE ANDERSON (BBC). In 1999 Jim wrote and starred in the 12 part comedy series THE JIM TAVARÉ SHOW Channel 5. A half hour of comedy sketches and stand-up, THE JIM TAVARÉ SHOW featured everyday tales of Austrian composing folk from one time child prodigy, Wolfgang Amadeus Mozart as well as a weekly end-of-show finale starring the Politically Correct Dancers. Other new characters included six foot blonde glamour puss The Uncommitted Transvestite; he of ancient proverbs, The Kung Fu Monk; Jim's very own nine inch pianist Fingers Wilson and The Bawdy Bobby, a member of the constabulary with a penchant for lewd suggestion. Produced by Phil Bowker, (HARRY HILL'S FRUIT CORNER and TV DINNERS for BBC Radio 4) and Directed by John Hobbs (SOME MOTHERS DO 'AVE 'EM, MONTY PYTHON, BRUSH STROKES), THE JIM TAVARÉ SHOW was broadcast on Channel 5. · Born in 1963, Jim was brought up in the small town of Macclesfield. It was at school where Jim first took up the double bass: "It meant my parents would meet me at the school gate and give me a lift home"
· Narrowly escaping becoming a member of Joy Division, Jim got together with some Mace boys and formed Rigor Mortis, a local psychobilly band. · Deciding he wasn't up to a career as a psychobilly bass player, Jim left the band to attend RADA where he trained professionally between 1985 and 1987 alongside a young Ralph Fiennes. "That was the first time I discovered plastic beer mugs." · Jim had a distinctly different style from the rest of the comedy scene, which at the time was very politically orientated. He had a small guitar with which he would get up and sing songs or he would do impressions from Star Trek: "I got some of the best heckles in those days, one guy stood up and said 'it's comedy Jim but not as we know it'." · However, it wasn't all a bed of roses in those early days, one London club even hosted a regular challenge to 'Get Jim Tavaré off in 3 minutes'. It wasn't until Jim recruited the double bass into his act that his career took an upward turn. "To begin with the bass was literally no more than a prop I could lean on - something to hold onto, like Dave Allen's cigarette. I was really using it as a surreal sight gag, not at all as an instrument." · In fact, Jim would lumber this huge, cumbersome double bass from gig to gig for just one joke. That was the crux of his act. Jim and his bass, affectionately known as Bassie, were to become one of the most original and impressive double-acts in comedy. · Jim has since traveled the world with Bassie. On one such trip at the height of Nirvana's fame, Jim met the late Kurt Cobain in The Holiday Inn on Sunset Boulevard. To everybody's enjoyment Jim and Kurt got together on the piano performing a few numbers for the onlookers in the hotel lobby. This was of course once they had been introduced, since not recognising Kurt, Jim initially approached a 'roadie', thinking he was the grunge front man. · Despite his fondness for Bassie, Jim feels he has been a victim of his own invention. Throughout his career he has worked on material that he could never perform because of his connection with the double bass. In the last two years he has moved away from the bass, working on new material which he is now looking forward to bringing to life on the small screen. 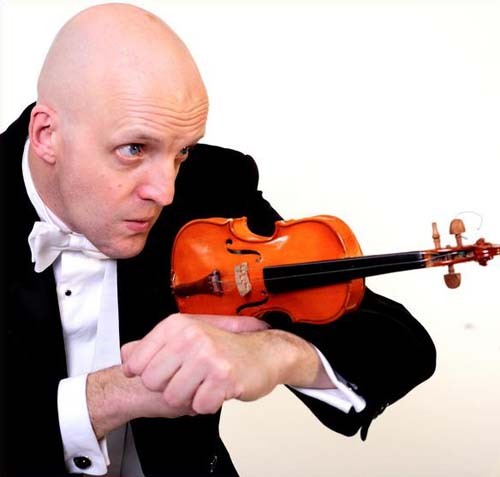 · THE JIM TAVARÉ SHOW featured Jim's four month old son Louis as Mozart Junior.